A true renaissance woman, Author, Professor, Dietician and Chef Lourdes Castro is a formidable talent in the culinary world. 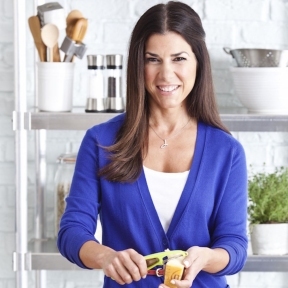 “I enjoy creating deliciously healthy recipes with my students and for my family. I really love being in the kitchen, I am really happy there,” said Castro, who is an Adjunct Professor at her alma mater NYU. Castro, a Miami native with Cuban roots, was introduced to cooking later in life. “Cooking wasn’t something I grew up watching in my family,” laughed Castro. “It was so the opposite. The women in my family didn’t cook. So later on in life I had to teach myself when I became interested in the science behind food.” Castro graduated with a Bachelor’s degree in Nutrition and Food later on earning her Master’s Degree in Nutritional Sciences at Columbia University. “Food is such an important part of our lives, but as you know, we as Latinos often times don’t make the best decisions when it comes to selecting foods that will help in our overall health,” said Castro. “So that is truly what motivates me. To educate families across the country on how to eat and live healthier.” After three cookbooks and a Latino Initiative through the American Heart Association under her belt, Castro recently joined forces with Chobani Greek Yogurt to create delectable dishes for everyone to enjoy without the worry of sacrificing taste. “I feel that’s what everyone thinks about when the word “diet” or “healthy eating” comes to mind,” laughed Castro. “People feel they have to forego the taste and that is simply not true.” Inspired by the versatility of Greek yogurt, Castro produced several recipes with the help of Chobani Greek Yogurt to help anyone who’s New Year resolution was to eat healthy. “I love this product. You can use it in dips, you can use when roasting potatoes. I mean, it is such a healthy alternative to butter and oils. And the taste is still there!” Castro shared with Lawndale Bilingual Newspaper some of her Chobani recipes for you try in the New Year. Buen provecho!